Police found the cash stuffed inside biscuit tins and sweet boxes. 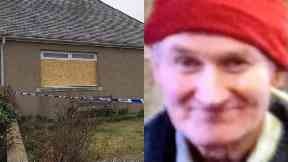 Brian McKandie: Found dead in rural cottage. More than £200,000 in cash was found stashed in biscuit tins and sweet boxes around a murdered man's house, a trial has heard. Brian McKandie was found dead at his rural home in Aberdeenshire, in April 2016. Giving evidence at Sidebottom's trial on Tuesday, Sergeant Stuart Fisher explained how he had been put in charge of managing the crime scene. Mr Fisher told the High Court in Aberdeen that he and other officers and forensic examiners had begun to clear out a bedroom off the living room where Mr McKandie was found dead. It was then that the officers found a biscuit tin stuffed with £7000 in cash on top of a dresser. Mr Fisher said: "It was a shock to find the tin. As soon as we found the first one I called in a photographer." Officers then discovered sweet tins and boxes containing amounts ranging from £19,000 to £24,000 at locations around the cottage. Further sums of cash were found in another biscuit tin, a shortbread box, plastic bags and a wallet in the bedroom. In total the court heard that £201,170 was found in the house. Advocate depute Iain McSporran QC asked the officer: "Had there been any suspicion of a massive amount of cash would steps have been taken earlier to secure it?" Mr Fisher said: "Yes. There was suspicion that he would keep money in tins but never suspicion we would find what he did have." Sidebottom, 25, of Rothienorman, Aberdeenshire, denies a single charge of murder. It is alleged that on March 11, 2016 at Fairview Cottages, Badenscoth, Rothienorman, Aberdeenshire, he murdered Mr McKandie and robbed him of a sum of money. Sidebottom denies repeatedly striking the victim with an unidentified implement or implements. He has lodged special defences of alibi and incrimination.